​Advent begins on Sunday November 27th. Advent is the time when Christians prepare their hearts for Christ's coming at Christmas. While the rest of the world jumps right from Thanksgiving to Christmas, Christians take the time to focus on what Christ's coming truly means. ​This week is the last week of the church calendar year when we celebrate "Christ the King" or "Reign of Christ" Sunday. We remember the teachings and sacrifice of our Lord before we begin, again, to prepare our hearts and lives to receive the good news of Christ's birth. But Jesus did not act like a king, and he was killed and mocked for that on the cross as we hear in this week's gospel. What does it mean for us to have a King like that- whose power was shown in weakness, who lifted up the lowly and healed those the world had forgotten? How do we follow this King in a world full of hate, fear and pain? Come and receive some guidance based on Jesus' words and actions. In our second stewardship message, Pastor Paul talks about the challenge and opportunity we all have to move up in the amount of money we give to the work of the church so we, as a church, move forward into stronger ministry. ​Let's all commit ourselves to growing in our personal stewardship! This is the first of two Sundays dedicated to our financial stewardship for 2017. This message is based on our stewardship theme of "Forward In Grace". God calls us to trust in his guidance and grace as we move forward to do his work and support the many ministries of God's church. ​It's easy to make everything about us in life - we even tend to think that God's love & salvation depends on us, when it really doesn't. It's a gift from God. That was the heart of Martin Luther's Reformation - that God's Grace through our faith in Jesus Christ is what brings us salvation & not what we do. Jesus has made a place for us & frees us from the burdens of carrying our sin. Each year we take time to indicate where & how we will share the time, talents & skills we will use to serve the church. Pastor Paul's message talks about doing our jobs as part of the church to help the whole church with its work. We all know that relationships take work and can be hard. This is true whether these relationships are with family and friends, or with God. This week I am preaching on the strange story in Genesis 32 about Jacob wrestling with an unknown man as he traveled back to Canaan to face his estranged brother Esau. The story of Jacob's struggling relationships with this family, and his growing relationship with God, offer us insights into dealing with our own relationships. ​At both our services, we will have a special service of dedication. We will celebrate our incredible, ministry-changing new building as we place it in God's hands. We will pray for God's blessing and guidance. ​As Christians we know we're supposed to trust God. Jesus says we need to trust God in the same way that children trust their parents. But how do we go about learning this kind of trust? This week I am preaching on Psalm 37. This ancient Israelite song deals with the issue of being righteous before God when there are so many wicked people who do whatever they want and seem to get away with it. The psalmist lays out a number of steps for godly people to follow so that we learn how to put our total and complete trust in the Lord. I hope that I will be able to offer you some practical biblical advice on this. ​Have you ever felt like something is missing from your life? You just can't quite put your finger on it? God misses us when we wander away. Jesus tells the story of the lost coin & the lost sheep to show us how important each one of us is to God. Forgiveness can be a difficult thing, especially when someone does something to personally hurt us. Forgiveness is what the Apostle Paul's very brief letter known as Philemon is all about. It's not very often that a pastor gets to preach an entire book of the Bible in one sermon, but that's what I get to do this week as I take you through this marvelous and deeply personal letter between Paul and his friend Philemon over how to deal with healing a broken relationship. Philemon is nearly 2000 years old, but it is as relevant as your life and mine today. It contains lessons and truths we all need to know, especially if you are dealing with a broken or strained relationship in your own life. ​All is Vanity! The Teacher, the writer of Ecclesiastes, warns us against putting all our energy into work. The reading from Colossians 3 encourages us to let go of greed and take hold of a life shaped by Christ. Jesus told a story of a man who filled his barns full of food so he could relax- but on that night he died. All pretty sobering stories! But still valid in our lives today. Where is our focus? How do we let go of our greed and take hold of Christ? The sermon will look at these questions and some real life examples of how to do this. Moses calls the people together to renew the covenant God made with them & their ancestors, saying "Surely, this commandment that I am commanding you today is not too hard for you, nor is it too far away." Jesus encourages us to love our neighbors. Sometimes it is MUCH harder to love our neighbor than it is to love a complete stranger. How can God's commandments & God's love help us to love those both near & far. *Please note that the battery in Pastor Heidi's mic gave out in the middle of the sermon, so you will need to increase your volume to hear it. We apologize for the inconvenience. Because of the rain we had to have the service inside. Listen to Pastor Heidi's sermon from that day. In this week's gospel Jesus talks about who his family is (Luke 8:19-21). He speaks of his relationship with those who know and do God's will. In Galatians 3 the Apostle Paul declares that all who are baptized into Christ Jesus are one; united as family in love. In this world that has so many divisions and where we build so many walls, our faith in Jesus calls us to be one in his love. This vital fact is at the heart of this week's sermon. As we begin our two weeks of holding up our financial stewardship for 2016 I am going to talk about the importance of supporting our building program next year and in the future. This building is the Lord's house. It is an important place that serves so many purposes. Our offerings go, in part, to help pay for the construction and upkeep of our church home. I am using the Old Testament story of King Jehoash (2 Kings 12) to help illustrate what we are called to do to support this place as part of our overall ministry at Grace Lutheran. If we think that we live in a world that is divided along racial, ethnic and religious grounds, we haven't got a clue what things were like in Jesus' time. 2000 years ago the divisions among these groups were enormous and often very hostile. It was into this world that Jesus stepped. He came preaching and living love and acceptance of all people. This Sunday's gospel story about Jesus and the Roman Centurion, a military officer in the hated Roman occupation army, shows who Jesus was and how he treated others. Our Lord still has powerful lessons to teach all of us today. Honoring our graduates is a much loved Grace tradition! 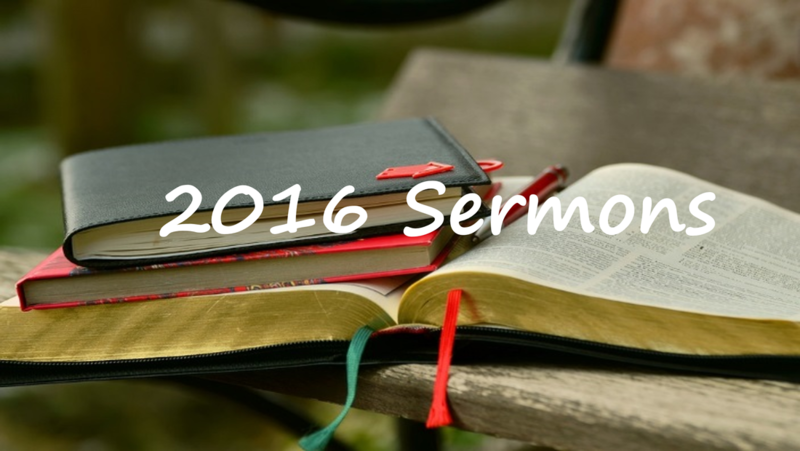 Listen to Pastor Heidi's sermon from this special service. ​This Sunday is the Day of Pentecost, the day when God poured out the Holy Spirit upon the followers of Jesus who then went out to preach the Good News of Jesus for the first time to the crowds gathered in Jerusalem. This was the birthday of the Christian church. These followers really knew what it meant to love Jesus. Our Christian faith is much more than believing in Jesus. It involves so much more than just keeping rules and laws. Faith truly means to live being in love with Jesus and letting that love shape and guide our lives. Our message this week discusses this kind of love. On April 3rd, guest speaker Beth Walch spoke about the story of Thomas and the disciples in the upper room and Jesus sharing his peace with them. Please go to the Holy Week Series to listen to these sermons. ​Jesus healed a man with spit and mud, and the man said, "I was blind but now I see..." Jesus said, "I came into this world for judgment so that those who do not see may see, and those who do see may become blind." What are we blind to? How does our sin cloud our ability to see clearly? In the reading from Isaiah, God tells us "I am about to do a new thing; now it springs forth, do you not perceive it?" The sermon will aim to help us open our eyes to see the goodness, the newness, the transformational power of our God. "Now faith, hope, and love abide...the greatest of these is love." We spend a lot of time trying to be the greatest or the best, and also wondering what the great purpose of life is. God tells us love is the greatest thing, but choosing love and compassion doesn't always make us very popular (see the gospel lesson where Jesus is driven into the wilderness and tempted by the devil!). We also have great excuses (Jeremiah: I'm too young! Us: I'm too busy!). No matter what our struggle or excuse is, God is with us. Home Town Boy Does WHAT?! This week's gospel story is one of the strangest in the Bible. It deals with Jesus' return to his home town of Nazareth following his baptism and temptation. Given the opportunity to speak in the synagogue, Jesus picks a text and says some things about himself that leaves Nazareth in an uproar and puts his own life at risk. Jesus has always been a controversial character. This story shows why. Over the next several weeks our gospel stories are all from the beginning of Jesus' ministry. This week it is that delightful, and puzzling, story of Jesus turning the water into wine at the wedding in Cana (John 2:1-11). It's not much of a miracle when you compare it to healing a leper or driving out a demon. But John thought it was important enough to include in his gospel. In fact, it's one of only seven miracles (or "signs" as John calls them) in the entire gospel. So, what's the point of this story? What does it tell us about Jesus? What does it say about how people came to understand who he was? Let's have some fun looking at this curious story and seeing what it tells you and me about Jesus. This week we celebrate the Baptism of Our Lord. Jesus was baptized by his cousin, John, and we all are baptized in the name of the Father, Son and Holy Spirit. What does being baptized mean in our lives? How does being a Child of God affect who we are?